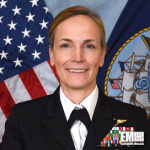 Rear Adm. Sara Joyner, head of the U.S. Navy‘s Physiological Episode Action Team, will be assigned as director of the Joint Chiefs of Staff’s manpower and personnel directorate, or J1, the Defense Department announced Tuesday. Joyner leads a Navy team tasked to examine occurrences of physiological episodes among naval aircraft pilots and coordinate with technical professionals to explore PE mitigation strategies. She became a naval aviator in 1991 and went on to serve in various leadership positions in the Navy, including roles as commanding officer of the Super Hornet Strike Fighter Squadron; commander of the Carrier Air Wing 3; and director of the Navy Senate Liaison within the Office of Legislative Affairs. The J1 directorate advises and supports the chairman of the Joint Chiefs of Staff on matters related to manpower and personnel.